From the back cover: To acquire this "magic touch" with the arranger's pen, Winterhalter served a long Swing Era apprenticeship. He was born in Wilkes-Barre, Pennsylvania, on August 15, 1090. He studied violin and reed instruments at St. Mary's High School there. Later he became a member of the string section of the orchestra at Mount St. Mary's College in Emmitsburg, Maryland. He soon became leader of the campus orchestra there, and even supported himself for a while by giving music lessons. When things were slack, he worked as a railroad laborer, a store clerk, and even as a high school teacher. His professional career began at the age of sixteen. In 1925, he became a dance band sideman at the salary rate of six dollars a performance. "Although in college the violin was my major interest," he says, looking back, "in the band I played with later I always played reeds." For a period of twelve years, Hugo was a sideman in many dance bands, among them the name crews headed by Larry Clinton, Raymond Scott and Jack Jenney. 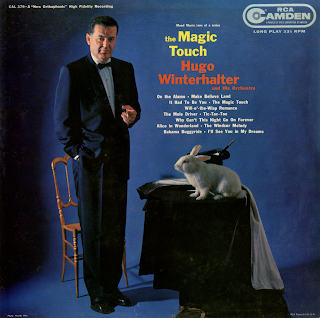 When he left the bustle and constant travel of the road band for the less hectic life of the arranger, Hugo had behind him experience in writing for dance bands, swing bands and vocalists. He even did some writing for dance bands with string sections. It was while he was arranging for Tommy Dorsey's band in the mid-'40s that he began to make his mark. Many of his scores which were played by Dorsey still sound rich and undated today, some fifteen years later. "I had been working for twelve years before I got an opportunity to write for strings with Tommy Dorsey." Hugo recalls. "I liked it better than anything I'd ever done before." His arranging credits also extend to such diverse musical gatherings as those headed by Vaughn Monroe, Count Basie, Will Bradley, Claude Thornhill, Billy Eckstine and Jimmy Dorsey.